Fifteen hopefuls from Nigeria, Kenya and Tanzania will be selected to go through gruelling themed challenges, anda winner will emerge as Africa's first karaoke television sensation. Paired with the music industry’s heavyweight mentors, the fifteen singers will face the panel of judges every week in the hope to secure their spot in the live finale. · 3rd Place winsUSD 10,000 and a Tecno Phantom 5 smartphone. · 2nd Place winsUSD 15,000, a 3 month internship program at Chocolate City + Tecno Phantom 5 smartphone. · 1st Place winsUSD 25,000,Record a Song with a Mentor/Judge – to be released commercially, a Music Video, a tour with a popular act and a chance to open the show, and aTecno Phantom 5 smartphone. That's not all! If you submit your recording, you stand a chance of getting entered into a bi-weekly draw to win a brand new Phantom 5 and other exciting prizes. So…What Does It Take To Qualify ForThis Audition? · Select Your Track: Select your favourite track from the Track List. You can listen to the track and read the lyrics. · Record & Upload: Record your own karaoke rendition and submit the track via the Submission Form on the website. · The Judges Review: The judges will review the entries and select the top recordings. Qualifiers will be notified directly. · Show Time: Qualify through the auditions phase and get the chance to Own the Stage on DSTV’s Africa Magic channel. How Do You Record A Killer Karaoke? · Choose Your Track Wisely:Visit the Tecno website to select a song that is in your range, learn the melody and memorize the words quickly. · Practice Makes Perfect: If you have a full-length mirror, a microphone (or a hairbrush), and an instrumental version of the track, use them to practice! · Sound quality is very important: Record your song in a quiet environment so as to cut off unnecessary sounds like; background voices, footsteps, chair squeaks. 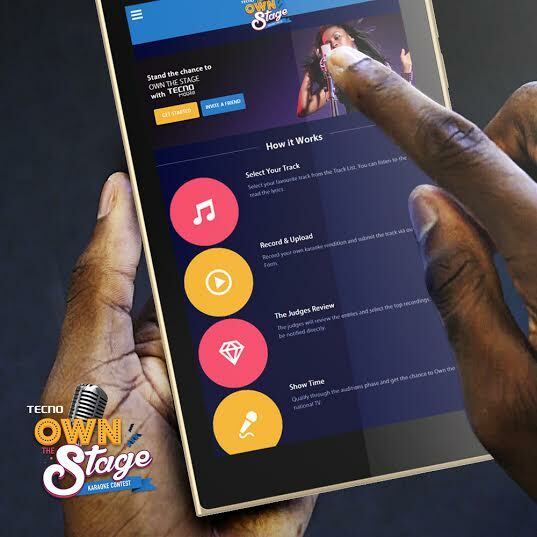 · Upload your song: After recording, visit Tecno Own The Stage website to upload. It’s that simple! Tecno Own The Stage will premiere on Africa Magic on the 25th of October 2015. Are you Africa's first karaoke television sensation? Visit www.tecnoownthestage.com to participate and keep up with the competition on Facebook, Twitter and Instagram.